Cross country flight and practical test. From FATP Tempe (Bloemfontein) to FAJK (Jan Kempdorp - a fairly obscure field, not listed in many places, apparently used to be a military field). I flew right past it without seeing it initially - pilotage is not trivial. At least I did not fly over the ammunition depot there, a prohibited zone. 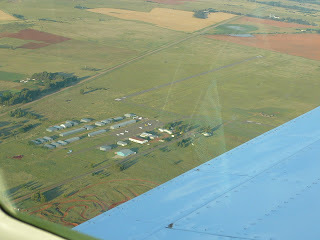 Then off to FAKM (Kimberley) to refuel, and back to Tempe. 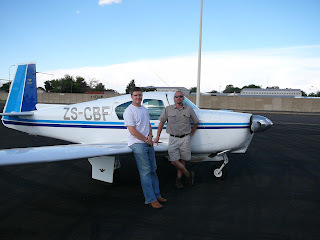 My instructor Stefan Veldman and I in Kimberley after refueling. Back to FATP Tempe, left downwind for runway 01 (you can see the other end, runway 19, in the lower right corner). Practical test FATP-FAJK-FAKM-FATP was published on November 16, 2006 .